I love the evening! Once Kat is off to bed, I adventure around the kitchen, chatting with my friends. Sometimes the soup pot will have a new joke to tell, or the kettle will start spouting folksongs. Kitchenware can get quite rowdy past midnight! But dearies, I don’t need to sleep like you all do. After dinner, Kat enjoys a warm, soothing cup of tea but she doesn’t want any caffeine to keep her awake at bedtime. The days are starting to get a little bit shorter, and nights are a little bit chillier. It’s the perfect time to talk about teas to drink in the evening. Kat is always looking for new ways to create a tranquil nighttime routine and there are many teas that can enhance the setting. Do you drink rooibos? Rooibos is always a good choice after dinner. It’s not actually a tea, but an herb made from the leaves of the rooibos bush found in South Africa. It’s often referred to as Red Tea or African Red Tea. It’s pronounced ‘roy-boss’, which is not easy to tell just by looking at the name! I’ve had to correct many of Kat’s friends. The flavor of rooibos is quite unique. It is naturally sweet with a honey-like flavor, a bit nutty and spicy. Kat often thinks it has a bit of a vanilla flavor as well. If you are looking for a decaffeinated alternative to tea, you should give it a try. It is a smooth, calming brew. 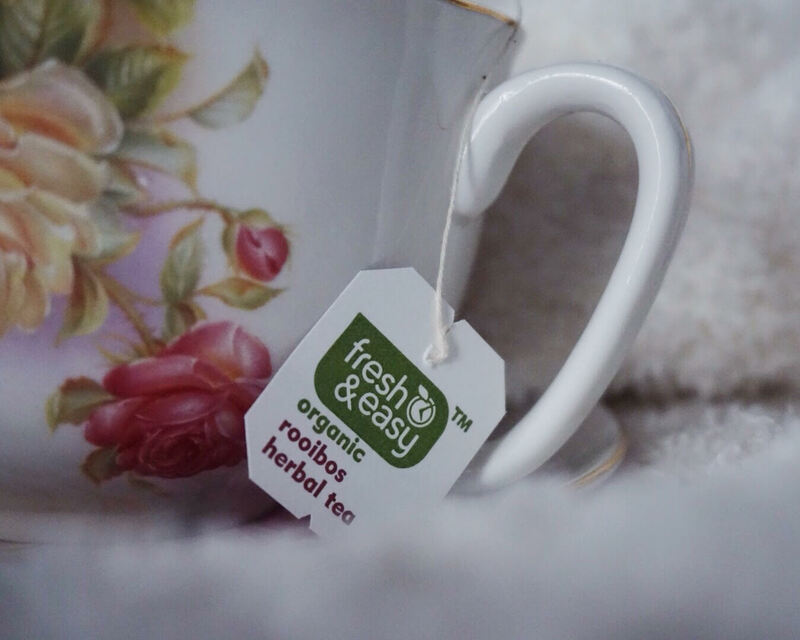 Kat enjoys this Fresh & Easy organic rooibos herbal tea on many quiet, chilly evenings. She actually discovered it after a yoga class. Her yoga studio often has invigorating herbal teas to enjoy after practice. She will often breeze past them but when she noticed rooibos, she stopped to have a sip. She hadn’t tried it before and had no idea what it was! She was surprised at the flavor. It was unlike any other herbal tea she’d ever tried. It has a strong flavor that is similar to black tea, but also quite different with the honey and spice notes. She also appreciates the individually wrapped teabags as she can take them to work, or on long plane flights when she needs a little extra help to relax. There are many herbal teas are perfect in the evening. Chamomile is a classic choice. The sweet, floral flavor is instantly relaxing. It is sweet enough alone, or takes to a bit of sweetener nicely. The flavor is gentle and calm and the aroma will fill your room with the scent of fresh flowers. Peppermint tea is also a popular choice among Kat and her friends after dinner. Kat often serves it at dinner parties in little glass cups along with a few springs of fresh mint. She loves how the glass cups enhance the vibrant color. It’s refreshing after a heavy meal, yet peppy enough in flavor to stimulate a lively after-dinner conversation. Ginger tea is also lovely after a meal. Kat simply grates a teaspoon or two of fresh ginger into my cup, depending on how spicy she wants her tea. Then she simply pours some boiling water over it. You can let it steep as long as you like. If you don’t like the idea of drinking pieces of floating ginger, simply put the grated ginger in a strainer or paper tea filter. I personally enjoy the little bits as they float and tickle the sides of my cup! Kat agrees, and likes to munch on the little ginger bits. Feel free to add some sweetener as it can be spicy. But it’s the perfect way to take a deep breath, relax, and digest after a meal. 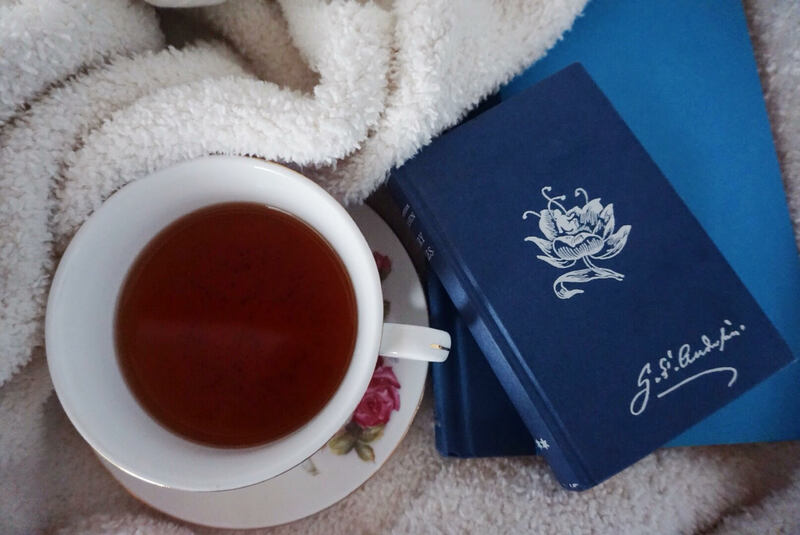 Just thinking about these teas makes me want to grab a blanket, a good book, and sit by a crackly fire. What do you drink when you’re trying to wind-down in the evening?